Oh man, I can see it in my eyebrow. Yeah, when you look in your eye. -Ahh! Hey, Guys, it’s Mi Anne, and this is Beauty With Mi. If you haven’t noticed, I do a lot of crazy facials on Beauty With Mi. 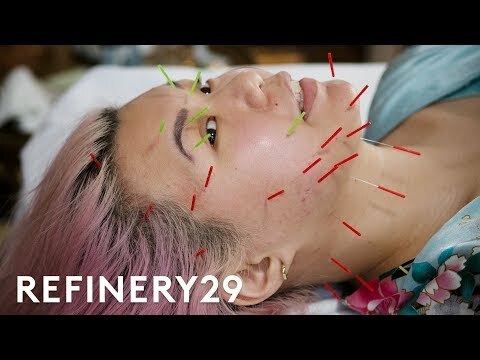 A couple of you guys asked me to try facial acupuncture. For those of you who are new to acupuncture, it’s an ancient Chinese medicine practice that has been used for thousands of years. In fact, in 2003, the World Health Organization officially backed acupuncture as a medical treatment. And it was proven to help with a host of different issues, from depression to rheumatoid arthritis. I finally did it earlier this month after reading all of your kind comments and got to say it was gratifying. I headed over to see Sandra Lanshin Chu who is an acupuncturist, herbalist, and founder of this wellness center called “Treatment by Lanshin.” She specializes in facial acupuncture naturally. I did her facial acupuncture and gua sha treatment. Okay Mi, so we’re going to do facial acupuncture today. The first thing that I want to know is what your concerns are. Well, I have combination oily skin to start. Okay. And I get occasional breakouts, especially along my jawline. I’m prone to puffiness and a little bit of redness. Facial acupuncture can help address a lot of the things you mentioned. Acupuncture can move the circulation in the tissues. So with acne, often the issue is stagnation in the tissues. And for puffiness, the same thing. It’s an issue of circulation, not being optimal. Basically, we’re helping your tissues function better. Well, should we start? Yeah let’s get started are you ready? Yes. So, we’ll start with your neck. We’re going to open your neck, so you’re just going to feel a little, nothing probably. Did you think that? No. Okay, so your needle is in. Oh. What you’ll probably feel is a bit achy sensation, kind of like a toothache. That’s perfectly normal. You also might experience a muscle jump, which is your muscle releasing if you feel that. Alright, so we’re ready to flip you over now. We need to balance the energy, so that you don’t feel like, it’s all up here and get a headache or something. Many people consider acupuncture a relaxing treatment, but I didn’t think that it was. If you have any kind of aversion to needles, you probably won’t find it all that soothing. But Sandra did do a really good job of easing my nerves. Okay, you okay? Yeah, that was fine. One of the great things about Chinese medicine is it’s catered always to the individual. So what I will do on you will be very different than what I do on my next client. When things circulate better, they function better. And when things function better, there’s more health and vitality available to you. And that’s really what people are looking for when they are looking for anti-aging. They’re looking for that glow that comes from health. In general, this type of work, requires repetition, kind of like going to the gym. Ideally we would see you for eight weeks once a week or as close to that as possible. We’re changing a pattern, and a pattern takes time and repetition to change. Sandra made a point to needle only half of my face so that we can really see a difference between the needled side and the non-needled side. On my right side of my face there was virtually no redness, the puffiness in my face had severely been diminished. It was like night and day between my left side and my right side. After Sandra finished needling the rest of my face, she moved on to facial massage. Sandra is known for this technique called facial gua sha. Which is basically a very deep form of facial massage using a jade tool. That combined with facial cupping helps improve circulation and increase lymphatic drainage. So, facial gua sha actually comes from a bodywork technique that we use in Chinese medicine – body gua sha – and it’s pretty intense on the body. Like it’s fast friction and lots of pressure. When we apply gua sha to the face it’s much gentler. So we’re applying less pressure, not trying to create friction. Using the tool will create more of like a fascial release. Fascia is basically a layer of tissue that wraps your muscles. It’s an important layer to work with to release tension. So it’s really effective for lifting, sculpting, and contouring. After the gua sha, Sandra employed a bit of cupping, so she used these silicone cups and glided them along with my jaw just to remove any of the stagnation in this area. I have a lot of hormonal breakouts that occur here so she said that it would really help with that. After the treatment, I could instantly tell there was a difference in my skin. My face looked a bit more contoured, it was brighter, it was a lot less redness. Still, the treatment itself can get pretty pricey fast. It cost upward of $200. So Sandra and her team host a monthly class where they teach clients facial gau sha so they can maintain their results at home. I’ve been doing it for a few nights now and I really like it. It’s a very nice way to calm down after you put your skincare on. All in all, I really enjoyed the experience I feel like I learned so much and I’m really excited to keep using facial gau sha in the future.